"The Fry and the Furious!" is the forty-fourth comic issue, which was released 22 July, 2009 in the US. Fry and Bender have been playing Grand Theft Spaceship on the Planet Express Ship while Leela is in hypersleep. Bender soon dares Fry to fly the real ship as if it were the game, which results in their ship and that of the Hyper-Chicken crashing. At traffic court, the judge sends him to traffic school as punishment, but he also is sent to jail for contempt of court. Two weeks later Fry joins Hermes' weekly course. Zapp, who is also in the course, takes to bullying Fry and after the test, and an argument, Fry challenges him to a race... to the end of the universe. The other students overhear and the race gains several new contestants, a $500 prize and an additional side-bet between Zapp and Fry. The race begins, and further additional people have joined in. Leela wakes up, surprised to see she'd been asleep three weeks rather than three hours. After reprimanding the others, Leela informs them they're quitting the race. However, a quick chat with Zapp angers her and she decides to race. Zapp begins cheating, putting Sal to sleep, the Planet Express crew follow suit and the rest of the racers are also eliminated, while Preacherbot and Malfunctioning Eddie's ship explodes on its own. Reaching the end of the universe, Leela steers away while the Nimbus wins, smashing through the edge of the universe into nothingness in the process. The crew save Zapp and Kif, but when Leela learns of the side-bet, a date with her, she gives both Zapp and Fry a swift kick to the head. As a result of Zapp sneezing outside the universe, seven billion years later a mucus based universe with humanoid life forms. Robot Fry (universe 31 variant) says "MOVE!" in binary, with a CRLF (0D 0A) at the end. The Planet Express Ship seems to have had its hibernative naptosis facilities upgraded, with Leela using a cryogenic tube. Zapp: No, Kif, if my calculations are correct, the end of the universe is soft and fluffy like a velour pillow. 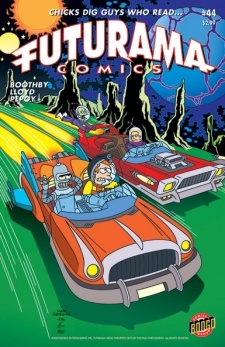 The universe 31 variant of Fry from "The Farnsworth Parabox" appears. A facehugger from Alien appears. Star Fox, other characters from his games and Mario appear in the jury box. Intergalactic Idol is an obvious reference to the various [National] Idol programs. The film at driving school is played on a futuristic Apple computer. In the film the crashed ships are George Jetson's ship, the Millennium Falcon, Battlestar Galactica and the Enterprise. Seating in the traffic school changes between shots, the back two rows disappear, Fry's seat is taken and an extra person appears to Hattie's right, shifting the other people in the row to side. If the black haired Fry was intended to be Fry-1, his clothing is the wrong colour. When Leela takes control of the ship from Fry and Bender the back of her shirt is missing. Debut: Female, Werewolf, Muppet, French and Miscoloured variants. This page was last edited on 19 December 2013, at 05:08.